April-2007 News & Updates from the City of Ulhasnagar/Sindhunagar, Maharashtra, India. Ulhasnagar City News indexed across timeline for easy retrieval. Creating heaven in a hell is no big problem as far as the Indian Navy is concerned. The naval personnel have shown the Ulhasnagar Municipal Corporation (UMC) that it is possible in the bitterly congested slum town of Ulhasnagar as well if there is a will on the part of the civic administration. The UMC has however used the opportunity to bag a state award for the task the navy did. The naval authorities have constructed a mega residential colony spread over 11.17 acres of land in Camp No 3 right in the heart of the town. The residential complex is fitted with all kinds of modern and eco friendly facilities thereby making it the only facility under the jurisdiction of the corporation to have so. Interestingly the entire township of Ulhasnagar was a military camp in British times. The armed forces handed over most portion of the land to government to settle Sindhi refugees but retained several patches in between. The 11-acre plot was one of the plots retained by the armed forces. The army then handed over the plot to the navy for a housing colony in 1994. At that time the plot was in a pathetic condition. It was a haven for anti social elements and encroachers. The entire plot was marshy with dumped solid waste and filth lying all over. The navy had to fight the encroachers till 1997 to regain its lost territory. Apart from constructing four buildings for residential purposes of naval civilians the navy has provided three well-maintained parks inside the complex named Ulhas River, Ulhas Udyan and Flower Garden. The Flower Garden had 12 species of flowers but since the soil is not feasible for flower plants the navy is converting the park into green house. The navy men also ensured that the 50 trees that existed on the plot before the complex came, were retained. On the contrary the sea warriors have planted another 150 trees to thicken the green cover on their plot. The naval officials also installed rainwater-harvesting system in the colony, which is the first under the UMC limits. It was an ultimate irony: the former commissioner of Ulhasnagar Municipal Corporation (UMC) and a Kalyan resident R K Sonawane, was hastily transferred last January, 2006, due to his bold decision to go ahead with the High Court-ordered demolitions of the unauthorised structures; a move that instantly earned him the wrath of his political bosses and the discontent of the affected people. Now, in March this year, the officer-on-special duty ( OSD) at MMRDA (Mumbai Metropolitan Region Development Authority), got invited by the World Bank (WB), Washington, for presenting a cerebral paper, before a select but elite audience of 200 specialists from across the world. DK + catches up with the upright bureaucrat from the suburbs who could make it to the power capital of the world, and WB, the financial heart of that world-on his own merit and hard work. DK +: Tell us about your visit. RK: Well, it was a very prestigious invite. There was a global meet of experts convened by the Annual Transport Forum, from March 20-30, in the headquarters of the WB, in Washington. I was the only Indian invited as a guest speaker there. Three more participants were there from India but they did not present any papers. DK +: What was the theme of your paper? RK: Resettlement of Project-Affected Persons for Infrastructure Projects in Mega City in the World’s Largest Working Democracy. DK +: Well, that itself is a mega title for a 15-minute power-point presentation! RK: (Laughs) Yes. There are three inter-related issues involved here. Resettlement, infrastructure projects and implementing them in a functional large democracy. DK +: What is your own experience as an urban manager, first in the suburban Kalyan and Ulhasnagar Corporations and later, in a nodal agency like the MMRDA? RK: As everybody knows, political interference can stop even the best-laid plans from fruition. Then there are other stumbling blocs like the NGOs in the way of the infrastructure developmental projects. They can be very frustrating for any officer. With only a fortnight to go to submit applications to regularise unauthorised structures in Ulhasnagar, the civic body has started a full-scale exercise to get buildings to fill in their applications. Of the 759 unauthorised structures, 50 per cent are yet to apply for regularisations. Following a High Court order that sought the demolition of illegal structures, the state government had passed a subsequent law to protect them. The court had then given the state 18 months to ascertain the eligibility of the 759 structures. Keeping in mind the 18-month deadline that will end in June, the collector had given time till May 15 to the properties to apply for regularisations. Municipal Commissioner S Kamble said that of the 759 structures, 422 applied for regularisations and 308 of them have been cleared. The rest of the cases have been kept pending. “About 337 structures have not applied for regularisations so far and efforts are on to inform them about the deadline through various mediums,” said Kamble. The Sindhis have multiplied in numbers ever since their ancestors migrated in the aftermath of partition, but their very language is in the doldrums The Sindhis have multiplied in numbers ever since their ancestors migrated in the aftermath of partition, but their very language is in the doldrums. In Mumbai, Sindhi schools have shut down completely and in Sindhi-dominated Ulhasnagar, the Sindhi learners’ strength is thinning out. Educationists here apprehend that this may be totally extinct in about five-six years. The only solace for Sindhis can be that this is happening not only to their language but to other vernaculars too because, as compared to English, the vernacular languages do not have much utility value to attract readers and hence English grows to be more and more popular at the cost of other languages. With Sindhi schools on the way out, retaining a distinct Sindhi identity is increasingly becoming a matter of concern. Sindhis have neither their own state nor any representatives in state assemblies and parliament to take up the issues of their language and promotion of their culture and arts. But, a handful in the community have been striving to keep the language and culture alive through regular activities. They include, Rochiram, Kundandas Rohra and Nari Gursahani in socio-political circles, Keerat Babani, A.J. Uttam, Popati Hiranandani in literary circles, Ram Panjwani’s cultural centre in Santa Cruz, Sundar Dangwani and Nand Chhugani at the Sindhu Youth Circle, Ulhasnagar. Many others have been trying to keep the language and culture alive through their varied attempts. Sindhi Sangat and Indian Institute of Sindhology have also come out with their works on CD-Roms and TV programmes to encourage the Sindhi language, culture and arts. Kudos indeed to these unsung heroes (and heroines too for that matter) for their never-say-die spirit in their service to what all Sindhis fondly and emotionally call Sindhri asaan ji boli, mithri assan ji boli (our language, oh! Beautiful Sindhi language). A 36-year-old cadet with the State Civil Defence, Usha Narang, has filed a complaint of cheating and threatening against a police sub-inspector attached with the Ulhasnagar Central Police station. Usha, an Ulhasnagar resident, has alleged that PSI Nandu Narang, who married her at Nashik's Vani Devi temple on April 26 last year, did not tell her that he was already married with two children. “I met Narang during the Shivratri festival in February last year when we were on duty at the same place. We soon became friends and he also became close to my family and daughter,” said Usha. Eventually, the two got married in Nashik. "Whenever I asked him about his parents he gave some or the other excuse and said that he would take me to meet them later," she said. While Usha rented a house near her parent's home, Narang stayed at the police quarters at Vitthalwadi. "Whenever I asked him to move in with us, he would have an excuse ready," said Usha. Things became ugly when Usha got pregnant in October. Narang asked Usha to get an abortion. "Apart from abusing and assaulting me, Narang also arranged for my abortion at a private clinic. I went with a friend, and got the abortion done in January," she added. t is observed that people tend to hold a very negative perception about the government-run institutes. Due to lack of infrastructure, negligence on the part of the authorities and lack of status, they have always been looked down upon. However, Ulhasnagar-based Government Technical School and College has altogether a different story. Established in 1956, this government-run institute was in a pathetic condition unto 2003. Among the 7-lakh population of Ulhasnagar only 7,000 knew of its existence. But within a span of three years it underwent such drastic changes that it bagged two national and three state awards. It has also recently received the ISO 9000:2001 certification. It was to discover the reason behind this sudden change DK+ visited the institute. There we came to know the fact that they had recently received a letter from the state government saying that they had bagged the first award named ‘Rajeev Gandhi Prashaskiya Award’ of rupees five lakh and also the ‘Gatimantra Award’ for the best education institute, which will be presented on May 1 by the hands of the Chief Minister. Along the way also came the ISO certification news. "I was appointed here in 2003 when the institute was going nowhere. Our institute comprising of school and junior college, has been providing education in various courses and Medium Competency Vocation Courses (MCVC) to about 1,000 students along the years. But the surrounding was in a pitiable condition with the place converted into a dumping ground. The building, infrastructure was crumpling and there seemed to be no educational environment for the students. Even the States Public Work Department did not seem to take heed of the situation," says the Principal V B Mahajan. Taking lessons from the recent outbursts by the public during the unprecedented power cuts in the suburbs; the power company has finally decided to buckle up. However this decision also has the consumer at the losing end, as there will be an additional daily power cut of one hour coming May in additional to the extra 45 minutes of load shedding imposed last Sunday. After the power went off for several time in the early hours of Wednesday, hundreds of irate residents from Shastri nagar and Devi chowk areas in Dombivli West gheraoed the local MSEB office and started pelting it with stones thereby injuring an employee and damaging a vehicle parked near the office premises. The citizens were annoyed after the power supply suddenly tripped around midnight bereaving the mostly working class residents of sleep in the arid season. This is the third such attack on an MSEB establishment in the district in the last few days. Few days back, the MSEB’s Bhiwandi office was attacked after regular unscheduled power cuts. Also the Shivaji chowk office in Kalyan bore the brunt of citizens’ fury fortnight back for the same reason. According to the information sourced exclusively by DK+, the MSEB plans to increase the duration of power cuts to minimise the unscheduled cuts that may occur in May that is the peak season of summer. Recently the company has witnessed several outbursts by irate mobs at their local level offices. More recently a mob in Dombivli West smashed windows of the power office near Dombivli West station while two weeks back the power office at Shivaji chowk in Kalyan and the one at Ulhasnagar had to face the fury of public that were protesting about the unscheduled power cuts. Are we part of a hardened and heartless society? It’s just four days since Satya and her family were torched by her jilted lover in Kandivli (East) and the media has abruptly gone silent on the issue. In fact, when the electronic media beamed the headlines on Sunday and followed it with lengthy footage throughtout the day, it was expected that the issue would hog the headlines in the next day’s print media as well. But lo! The coverage was either small or it just about managed to a little space on page two! Compare this to the times when for the first time in a similar case in Ulhasnagar, the issue hogged the headlines for days together, reaching as far as even the BBC for weeks to follow. In March 1990, SSC student Rinku Patil was appearing for her examination when her jilted lover Haresh Patel, accompanied by some of his friends, dared to set her ablaze in broad daylight for refusing to marry him. The case went on hogging the headlines with day-to-day details as well as the mystery shrouding the death of her killer Haresh Patel whose body was found on the railway tracks a few days after the incident. Even the trial in the Sessions Court at Thane used to draw larger crowds than the Pramod-Pravin Mahajan case these days. Several women’s activist groups used to rally around Rinku’s family day after day showing their support, not to speak of the politicians and the state home minister frequenting Ulhasnagar. The case had attracted so much attention that even police officials in the city had to cancel their leave programmes. Several trusts came up in Rinku’s name to perpetuate her memory. Still earlier, in January 1988, there was yet another case of one Vinay Dophe, a small child studying in III then, who also became a target of an acid attack that rendered him blind in both eyes. His was probably a case of mistaken identity, but the case attracted such wide publicity for days to follow that Vinay’s father, who still is a government employee in BSNL, received a lot of moral and financial support from the government for his treatment. Vinay is still blind and his family is hoping for a miracle to happen for their only son. Sixty-five-year-old B J Patil’s grandson Vivek Patil has just written his matriculation examinations and is eagerly awaiting the results. Vivek is Patil’s elder daughter Ranjana’s son. But matriculation examinations also bring back painful memories, says Patil. Seventeen years ago, younger daughter Rinku, 15 then, and Ranjana were also appearing for their matriculation exams. But Rinku didn’t return home, she was burnt alive by a youth, Haresh Patel, who had been harassing her to marry him, but she kept rejecting his advances. “In three years, she was to be married to a boy from our community she had been engaged to. Today, her children would have also been taking their matriculation exams,” says Patil. Patil remembers it was a Friday, but can’t recount other details exactly. His wife Pramila (60) helps out: It was March 31,1990. Their daughters had left for SES school at Ulhasnagar to take their geometry exams. The sisters were in the same classroom when Haresh, accompanied by his friends, barged in. He was wielding a knife. He caught hold of Rinku and threatened everybody out of the classroom. Haresh then bolted the door from inside and doused her with petrol and set her afire even as a shocked Ranjana, locked outside the classroom, screamed for help. But the screams of the sisters were lost in the empty corridors — everyone had run out when Haresh and his friends came. “The teachers, supervisors, principal, the policemen on duty at the examination centre and students — everybody fled. Nobody was there to help my daughter,” recalls Patil. Next day, Haresh’s body was found on the railway tracks. He had apparently committed suicide. Leelabai Ashan (52) of Gangajal Front was elected as the mayor of Ulhasnagar on Thursday. She defeated Nationalist Congress Party (NCP) candidate Sangita Kandare by 28 votes. Ashan secured 51 votes with support from the Shiv Sena, BJP and Congress. The deputy mayor’s post was bagged by Shiv Sena’s Ramesh Chavan who also secured 51 votes. Ashan who contested the Ulhasnagar Municipal Corporation election from Ward no 47, has made regularisation of the irregular structures in Ulhasnagar, charging less penalty for the irregular structures and improvement of water supply her priorities. The UMC office saw supporters of Gangajal Front and Shiv Sena thronging its premises to celebrate their victory. “Our only aim was to topple Pappu Kalani and develop Ulhasnagar,” said Sai Balaram, the man who formed Gangajal Front. “We (Gangajal Front), Shiv Sena, BJP and the Congress had come to an agreement wherein it was decided that the mayor’s post will be shared twice by the Shiv Sena and twice by Gangajal Front.” The equation between the parties is that the mayoral tenure of five years is divided into four periods of one year and three months and the parties will share each period alternately. The standing committee chairman’s post was given to the BJP and the post of the leader of the House to Mohan Sadhwani of Congress. Differences were evident within the NCP during the mayoral elections. NCP leader Prabhunath Gupta stayed away from the elections and did not vote for the NCP candidate. 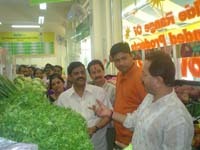 Radhakrishna Group initiative, Foodland Fresh opens three more outlets in Panvel, Kalyan and Thane on 31 March 2007. Speaking on this occassion, Radhakrishna Group’s chairman Raju Sheté said, “Besides offering the convenience of shopping for daily needs in the neighborhood, the Foodland Fresh stores offer consumers the best range, availability, price, promotions and service. There is a very high emphasis on food safety and hygiene. We are delighted to reach this milestone and are on path to a retail revolution based on a sustainable model”. With the opening of three new stores in Thane, Panvel and Kalyan on a single day, the total number of Foodland Fresh neighborhood food and grocery stores is now at 23. The break up of the 23 stores is as follows: Yari Road, Juhu, Mira Road, Mulund, Thane (4 stores), Kalyan (2 stores), Ulhasnagar (3 stores), Ambernath, Sanpada, Palm Beach, Airoli, Panvel (3 stores), Kalamboli , Kopar Khairane and Powai. Mumbaiites complaining of regular power cuts can learn a lesson or two from the municipal corporations in Thane district. For, both Ulhasnagar Municipal Corporation (UMC) and Thane Municipal Corporation (TMC) have adopted alternative sources of energy successfully to combat the perennial power crisis. In fact, the UMC headquarters in Thane itself is a prime example of the efficiency of non-conventional energy sources. Approximately 80 fans and tubelights in this office work on power generated from solar and wind energy. “We installed solar panels and aero generators in 2003, which can generate 20 kilowatt electricity. Since 2006, our fans and tubelights have been running on solar and wind power. The computers in our Citizens Facilitation Centre also operate on solar energy, so that citizens don’t have any problems during loadshedding,” says Mukesh Ailiyani, executive engineer (Electrical). Ulhasnagar residents have to put up with a seven-and-a-half hour power cut everyday.